Tyres are arguably as important for a motorcycle as wings to an aircraft. The bike rides on tyres and these are the only part of a vehicle which touches down the ground surface to bear all the forces, be it accelerating forces being driven out from the engine or the braking forces applied to bring down the vehicle to halt. The reason which makes tyres so critically important for a vehicle’s safety and performance is the fact that without good tyres even a high performance bike is good for nothing. Such bike will not be able to make quick maneuvers when needed, it will not be able to do justice with the leaning capabilities of the chassis & handling dynamics, braking performance will also be compromised and so will be the overall grip. In the article below we have a quick look on all the different types of tyres present in the market today, and we also explain in detail the right kind of tyre you must opt for as per your need. Starting off from the category of tyres which are used in the extreme performance environment. 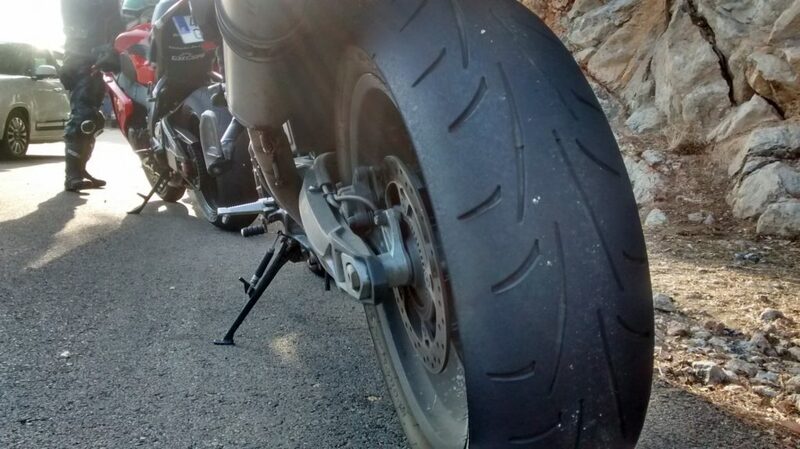 Sport class tyres are purposefully built for supersports bikes and high capacity naked. These tyres are designed to perform the best on tarmac and twisted turns, for example on a race track. A good sport class tyre should be able to do justice irrespective of the nature of the bike. There are a numbers of things it is supposed to be good at such as providing the needed forces to support the blistering power delivery from the engine without the wheel-spins, it should help the motorcycle to attain the maximum lean angle possible, it should reach the needed temperature fast, it should not over heat, it should not worn out fast, it should perform well in wet conditions, and it should provide maximum support during hard braking times. Generally these tyres comprises of three kinds of compounds – soft compound material, medium compound material and hard compound material. Tyres made from soft compound materials generally provide the best grip but its life is short due to faster worn out rate. Some tyres also have a combination of soft and hard compound which makes them last long while providing good corner grips. Unlike sport class tyres, touring tyres are not extreme performance oriented products but they are supposed to run for a thousand miles in a single go without breaking a sweat. The right set of touring tyres will last for as long as 10,000 to 15,000 kms or even more depending on the usage. These tyres are design to perform in all kinds of conditions be it roads, or no roads. They also provide good grip in rain, mud, slush and gravel since they are usually offered with tread patterns which allows the bike to be ridden in all conditions. One particular thing which is taken in consideration when designing touring tyres is they should not worn out fast even when ridden for long distances in a single go, and they should be able to provide good straight line stability to the bike on the fast highway speeds. Off-road tyres have nothing to do with running mileage or straight line stability of a motorcycle. Instead, their solid focus is to provide maximum traction to the motorcycle during extreme off-road riding conditions. Such tyres comprises of knobby design pattern that help with grip during off-roads. Such tyres can be found on off-road bikes and ADVs. They are generally shod on to spoke wheels, which support their performance during rugged riding conditions. Street tyres are found in most of the commuter bikes and scooters. Prime focus of such tyres is to balance out the performance and economy. These tyre are made to last decently long for up to 10,000 to 14,000 kms, while some specific tyres can do up to 15,000 to 18,000 kms which is incredible for any tyre. Such tyres are also decent in terms of overall grip, and braking performance. Most of the scooters, and street naked bikes come with street tyres. Cruiser tyres are mostly seen on muscle and cruiser bikes, designed best for comfortable, and cushioned rides. Such tyres are generally made up of large profile sections for extended suspension support and comfortable riding. Also, they are wide and perform very well in straight line stability runs. Tubed tyres are the ones which features a tube inside a tyre which is inflated with pressurized air. Such tyres are mostly used in off-roading bikes which come with spoke wheels. On the flip side, the tubeless tyres are more famous because they do not require a tube inside to support the tyre. On the other hand, they are made up of single-piece air tight tyres which are more resistant to punctures compared to their tubed alternatives. Also it is fairly easily to get a puncture fixed in a tubeless tyre. They are better for higher speeds as they provide fantastic stability and tend to heat up less often, but they are also slightly costlier. Use Grandpitstop’s universal puncture repair kit to repair all kinds of punctures under a minute! How to decode motorcycle tyre’s sidewall markings?